If you've followed the Grit and Polish for long, you know that we love using butcher blocks for kitchen countertops (like this one). They're inexpensive, timeless and easy to install yourself, making them the perfect material for DIYers like ourselves. At the Dexter House, we decided to upgrade our usual butcher block countertops to red oak (from Uncle Dougie of course) to match the new floors we laid. 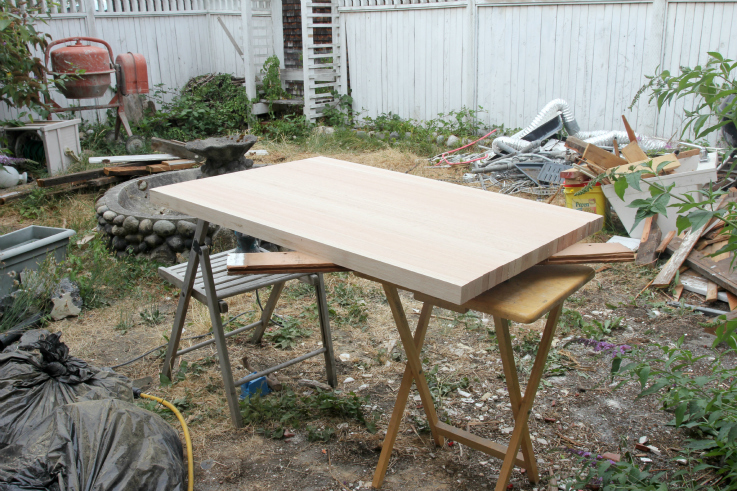 Installing the butcher block countertops took some time and precision, but overall, the process was fairly easy. First, I measured the kitchen and ordered the countertops in four pieces, each 26" deep and a couple inches longer than the length I measured. I added the extra length to the order to account for the 'old house factor'. You know, the nothing-is-ever-square-or-level-and-something-unexpected-always-seems-to-come-up factor. It's better to have too much and cut it down to size than to start with too little. After the first coat dried, I gave the butcher blocks a quick sand with the 220 grit to cut down the raised grain, and then put on a second coat. Then I brought the butcher blocks inside to dry overnight. After they dried, we installed the butcher blocks. There was a little more minor trimming involved in order to make sure each section fit snuggly and then we secured them to the cabinets using screws from the underside. Then we cleaned all of the butcher blocks thoroughly, sanded them again with 220 grit sandpaper, vacuumed up the dust, and sealed them with a third coat of Waterlox. Since we have kids in the house, I rounded all of the corners with the palm sander. We haven't had any bonked noggins yet, but when we do, hopefully they'll be minor. You may remember that we painted our lower cabinets black (you can read about that here), so we covered the countertops with thick paper to protect them from overspray. When we uncovered everything, the kitchen looked like this. The countertops look good with those floors, right?! Would you use butcher block as a countertop? If not, what material would you use in a kitchen like this? I promise to show you the entire kitchen renovation soon! p.s. 1880 never looked so good! Check out this gorgeous Australian renovation. p.p.s. My latest rug crush. I love how Julia used it in her minimalist playroom! p.p.p.s. I'm on day 11 of clean eating and I have to say, it feels goooood! Definitely motivated to stay off sugar after watching this documentary. Watch it! This film will blow your mind!